This past weekend in Cincinnati was a much needed get-away full of fun! We headed up late afternoon on Saturday, arrived, and hung out for a bit at the apartment. Kristie let me go through a bunch of clothes she was getting rid of and I was like a kid in a candy store. I feel like we like a lot of the same styles of clothes so I knew I was going to want a lot of it! Once our friend Riah (Rye-UH) got there I had to postpone my “shopping” so we could all head to Buffalo Wild Wings for a yummy dinner! I wasn’t very hungry because I didn’t know we were eating such an awesome dinner and I lost my mind in a gas station and spent the entire drive up stuffing my face with snacks. Whoops. We left there, walked back to the apartment, and walked over to the awesome pub next door that holds so many fun memories! We weren’t there too long before making our way back over to the apartment to get dressed for the dance cruise! And then, it was finally time to go! After 3 instances of someone losing or forgetting their tickets we finally made it to the boat with no time to spare. I’ll let the pictures do the rest of the talking! Reaaaally excited to be waiting in the line.. haha! I could try to explain what’s going on here.. but I wont. Not sure what song is being sung, but Ryan and Kristie are obviously doing a good job! Pausing my dancing to take a picture! Hah! I love this picture of Riah & I! This cake (one of three) is like Reese’s Cup/Vanilla/Chocolate cake .. I can’t explain how wonderful it was. I love how you can see the bridge in the background! The next day we went to Findlay Market, had an amazing lunch there, and then ended up at the Red’s game! Perfect weekend in Cincinnati! “Little Italy” sandwich on Ciabatta bread. Yumm. This week has been a pretty great one- can’t think of anything to complain about! But here we are again with one day left in the work week, headed into a wonderful weekend! And as I mentioned in my last post- we’ve got a pretty busy weekend scheduled involving dressing up and dancing the night away on a river boat cruise! Unfortunately this will be our last weekend in Cincinnati as we’ve known it for quite some time. Jackson and Kristie are moving and we wont be seeing them near as much. I’m sad, but- I’m thankful for all of the great times we’ve had with them there in Cincinnati! And now, we’re going to add one last great memory to the list! Can’t wait to make more in their new city, even if it is further away! There are certain people in your life that you know you’ll always be friends with regardless of how often you talk or see each other. And when you get together you can have fun lounging on the couch or out and about having a great time. You can sort of grow apart for a while.. and then come back together when you need it most. And I love this- it’s genuine friendship. I used to kind of think of friendship as something that needed to be held onto very tightly, maybe due to a fear of losing people in my life. But more recently, as I’ve experienced some of that growing apart and growing closer again aspect- I sort of see it differently now. Instead of holding on for dear life, it’s just better to let go- and let it breathe. If it’s real, it isn’t going to go anywhere. =) I’m so thankful for my true friends- both here and in Florida! Nate leaves early in the morning before I wake up and then I don’t see him all day until after work. He makes a point to wake me up just a little bit when he leaves and lay over top of me and hug me and kiss my face for at least a minute before saying bye. I love this and it makes me not feel so alone when I wake up and he’s gone. He also text messages me when I wake up each morning with a really upbeat, “Good morning Wife!” text message. It’s always different though and I wait anxiously to see what he will text me. And then, I let him know when I’ve arrived safely at work. And we text throughout the day on our breaks. This communication is key- in my opinion! It’s just little reminders all day that we miss each other and are thinking of the other one. I’m super thankful for our little routines! Cameos, $5 Deals, & A Dance Cruise! Today was a super short day at work and when I realized that both myself and my friend Brittany (who I work with) were about to be off at the same time, I knew that a trip to the mall was in order. So we agreed that she hadn’t spent enough money in Vegas this past week and that I needed to spend the $20 I just got for my birthday, and we went to the mall. We ended up in Arden B. almost right away. I love that store- rarely buy anything because of the prices, but I love to look! The girl working the front announced that there was a $5 wrack when we walked in, so naturally we went straight for that. There was hardly a anything on it at all- and then, Brittany picked up a dress and said, “Haven’t you wanted this for a while?”. My mouth almost hit the floor. I had been looking at this dress months ago (before I got married) when it was on sale from $125 down to $89 - just looking and wishing! AND HERE IT WAS FOR FIVE DOLLARS. It was a size 8 it said, and I’m like a 4-6 but I grabbed it and ran to the fitting room thinking I would buy it even if it was slightly big. As it turns out, their sizes run a little small and it fit perfect!! I danced and jumped up and down in front of the big mirror like it was Christmas morning showing Brittany and freaking out. Haha. So, I bought the dress and then about 3 minutes later I spotted a purse which turned out to ALSO be $5. Can you believe it? 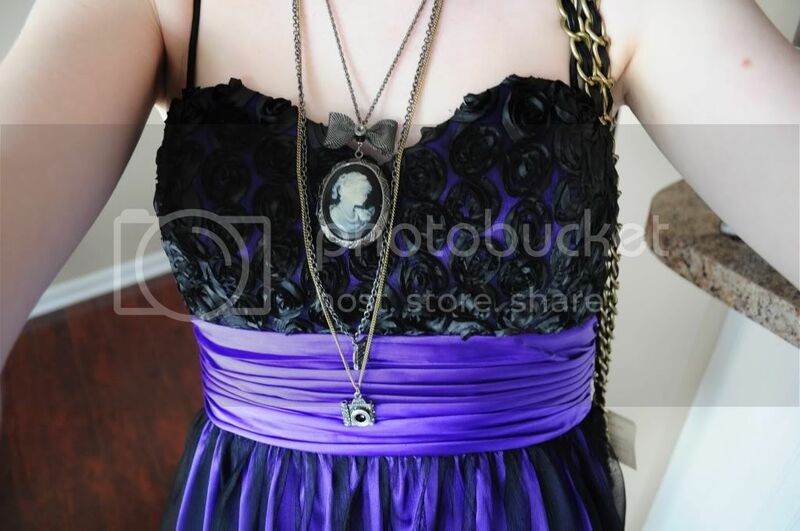 I find it interesting that I got such good deals wearing my “lucky” cameo necklace! And I think it’d be pretty neat to have something that is thought to attract health and good fortune tattooed on my body. =) Definitely mulling it over! Can’t wait to dance the night away on a riverboat cruise in Cincinnati this weekend! Do you remember me talking about this last year?? Here’s a flash back! View the rest here! And our captain for the night! Here is the Video Tour of the upstairs that I promised a while ago! Took me long enough! It’s a little long because I decided to go back downstairs and show that again because we actually have a TV now and things just look nicer in my opinion. Oh and, if you wanted to watch this video on mute it wouldn’t bother me one bit. I didn’t think I sounded quite so annoying last night- but after listening to it today, mmm.. yeah. lol. Please don’t judge me, I get all out of breath and lame when I take videos.